The original non-toxic, biodegradable, concentrated formula that customers have known and trusted for over 30 years is now available in lemon scent. Quickly breaks up grease and sludge, easily rinses off all water-safe surfaces. Cleans and deodorizes grease filters and traps. Ideal for use on floors, walls, counters, doors, concrete, tile and stainless steel. Nontoxic, readily biodegradable. Lemon scent. 1 gallon bottle, 6 bottles per Carton. 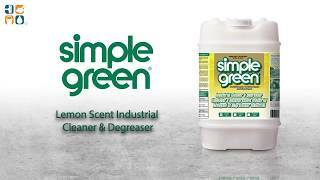 Sunshine Makers Inc. - Simple Green All-Purpose Cleaner Degreaser, Lemon Scent, 1 Gallon Bottle, 6 Bottles per Carton.